At a time open MAC’s MS office document version 2004, 2008 and 2011 on OS X Yosemite. 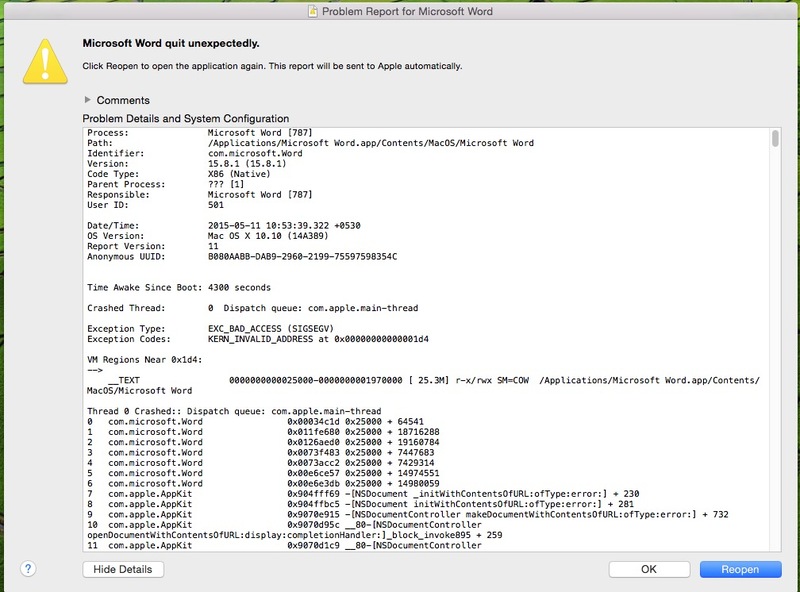 Most of the time MS Word, MS Excel, MS Power point giving error “Microsoft office Quit unexpectedly on Mac” at the time of open new document or open saved in OS X Yosemite. But you can solve this error and open your document without lose data. Microsoft gave perfect solution on how fixed problem of can’t access your document. Useful: How apply restriction on use installed Mac apps: OS X Yosemite. Note: Below solution working very well on your MacBook Air, MacBook pro, iMac and MacMini. 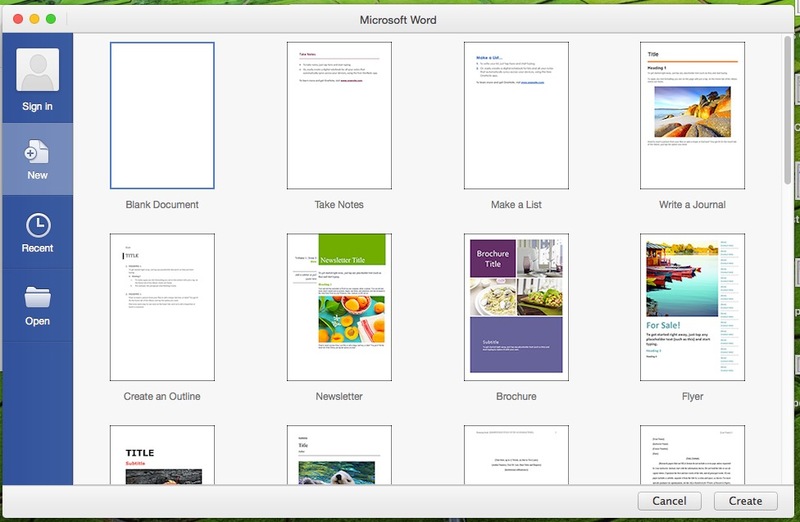 Here’s are the best trusted alternate possible solution on Microsoft Office word quite unexpectedly on Mac. So follow the below steps for resolve. you can also sent report to apple by click on reopen from error popup window. 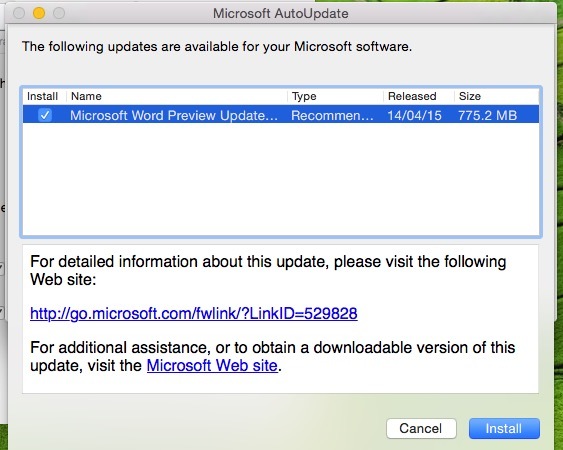 Step 1: When you open document, may be you will receive update message, Don’t ignore it and proceed for update. Step 2: Click on Check for update. 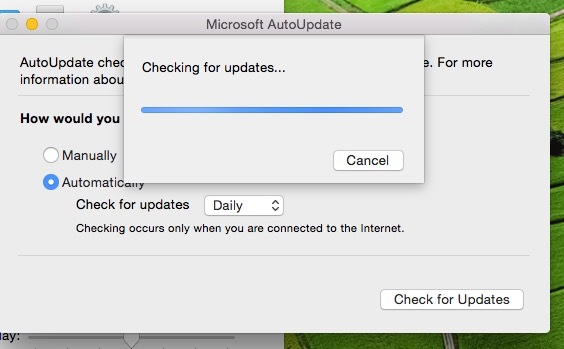 Step 3: Weight for gathering necessary updates for your running Mac’s MS office. Step 4: Now, Go for update. Next you have to wait for download files for update and after completed download, install on Your Mac. Step 5: Now Open your MS document, You will successfully read and write on it. Change your folder name as of your office version you are currently using. Step 2: Copy whole path Right click on it: Service > Revel in Finder. and From top menu tab Go > Go to folder. Step 3: From there you will see auto save document, just remove from it or move in to trace. Step 4: Now, try again for open word document on Mac. Go to the Library > Application Support > Microsoft > move document named com.microsoft.Word.prefs.plist to Desktop. force close your all device might be occurring error. Reopen document, now it should be resolved. 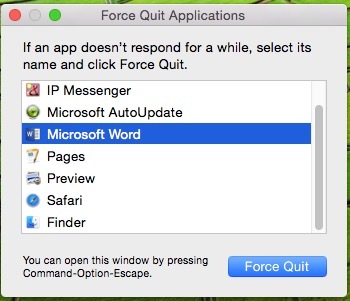 Still facing problem on Microsoft Office quit unexpectedly on Mac Yosemite. have you another way to fix out also comment in below box. we will be glad to assist you and your colleague.